Hypothalamus is a Greek word which means below thalamus i.e hypo means below and thalamus is still another structure of a brain. So the meaning of hypothalamus is “A structure that is located below thalamus”. It is a part of brain. More specifically, it is a part of limbic system. Its has various vegetative and endocrine functions that we would discuss below. But first lets learn about structure and then functions of hypothalamus. Before learning its functions, a medical student must have some knowledge about it structure as well i.e the anatomy. As mentioned in that start, the hypothalamus is located below the thalamus. It is a few cubic centimeters and weights about 4 grams. It is located just above the pituitary gland and is connected with it via infundibulum to the posterior pituitary. It forms the ventral part of diencephalan and is almost about the size of an almond. If we look at the sagittal cross section of an hypothalamus, it looks like a diamond shape. The hypothalamus sulcus is a grove in the lateral wall of third ventricle which separates superior portion of hypothalmus from thalmus. There are various nuclei that are distributed in hypothalamus and they perform different functions which would be discuss later. But first have a look the names of these nuclei and remember them. First of all it sends downward fibers to different structures in the brain stem i.e reticular areas of the mesencephalon, pons, and medulla and from these areas into the peripheral nerves of the autonomic nervous system. Then it also send upward fibers to cereberal cortex and other limbic structures. Finally it sends downward fibers that control the secretions of the master gland i.e pituitary gland. Hypothalamus has performs two functions for keeping blood volume and blood pressure nearly constant. This is achieved via 2 mechanisms i.e thirst mechanism and by controlling the excretion of water via kidneys. The thirst mechanism is regulated via thirst center in hypothalamus which is present in the lateral hypothalamus. When body fluids becomes too much concentrated, this thirst center is activated, person feels desire to drink water. The water excretion mechanism is regulated via hormones. The mechanism is as follows: when the body fluids become concentrated supraoptic nuclei of thalamus are stimulated. Fibers from these neurons descend to posterior pituitary via infundibulum. ADH (antidiuretic or vasopressin) hormone is secreted by the nerve endings into posterior pituitary. This hormone is the transported to kidneys via blood where it increases water re absorption from the collection tubules. Lateral hypothalamic area when stimulated causes extreme hunger and desire to search for food. While the satiety center that is located in the ventromedial nuclei of hypothalamus does the opposite effects to those of laternal hypothalalmic area i.e its opposes desire for food and hunger. Hypothalamus is called the master switchboard because it controls the secretions of the pituitary gland, which is called the master gland of the body. It controls both the anterior pituitary and posterior pituitary. When it is stimulated, it secrets some releasing factors that stimulates the production and release of hormones in the anterior pituitary. While one the other hand it produces hormones of the posterior pituitary and secrets them in the posterior pituitary. Hypothalamus helps in changing arterial pressure and heart rate. Stimulating posterior and lateral hypothalamus has always an increasing effect on both arterial pressure and heat rate. While on the other hand stimulating preoptic areas results in the decrease in both heart rate and arterial pressure. The preoptic area of hypothalmus is sensitive to increase or decrease in temperature. The blood flowing through this area stimulates nuclei of this areas by sensing increase or decrease in temperature. It then increases the sensitivity of temperature sensitive neurons in case of temperate increase. While depresses them in case of decreased temperature. A hormone oxytocin is secreted in response to stimulation of paraventricular nuclei of hypothalamus. This hormone then helps in contraction of uterus and myoepithelial cells that surrounds the alveoli of breasts. It helps in labor contractions and ejection of milk. 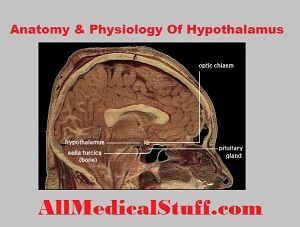 As you can see from the above list of functions of hypothalamus, it seems that hypothalamus, being a small structure of the limbic system has large number of very important functions that are very vital for life. glad to know that you like my blog. Keep visiting it regularly. i would be now updating it more frequently.